For companies integrated with QuickBooks Online and Xero, there is the option to match and fulfill Purchase Orders when posting through invoices from AutoEntry. This will pull through a list of all open POs for that supplier and populate the drop-down menu. 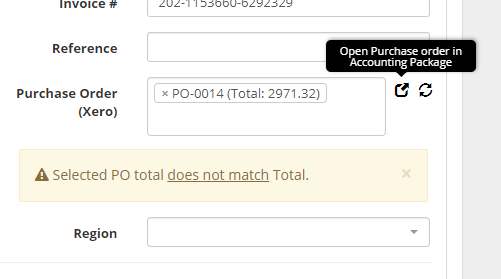 Simply click on the drop-down to select the relevant PO you want to apply the invoice to. If the PO selected does not match the amount on the invoice a notification will also pop up to alert you. The invoice will still process through and part-fulfill the PO.